"Does your mother know you're going down there on a Friday night?" Abramorama has released the first trailer for a hazy, indie drama titled Flock of Four, the feature directorial debut of director Gregory Caruso. We haven't heard much about this yet, but it actually seems like a nifty story for a film, and it looks pretty darn good. Set over the course of one night in 1959, the film follows four best friend teens who drive around Los Angeles searching for one of their music idols, legendary jazz musician Pope Dixon (a fictional character inspired by real musicians), as played by Reg E. Cathey (who passed away in February). The cast includes Braeden Lemasters, Uriah Shelton, Isaac Jay, and Dylan Riley Snyder as the friends, as well as Shane Harper, Coco Jones, and Nadji Jeter. I like the vintage look and feel to this. Take a look. Set over the course of a single night in 1959, Flock of Four follows four teens from Pasadena as they journey to Central Avenue, Los Angeles on a quest to find a legendary jazz performer. 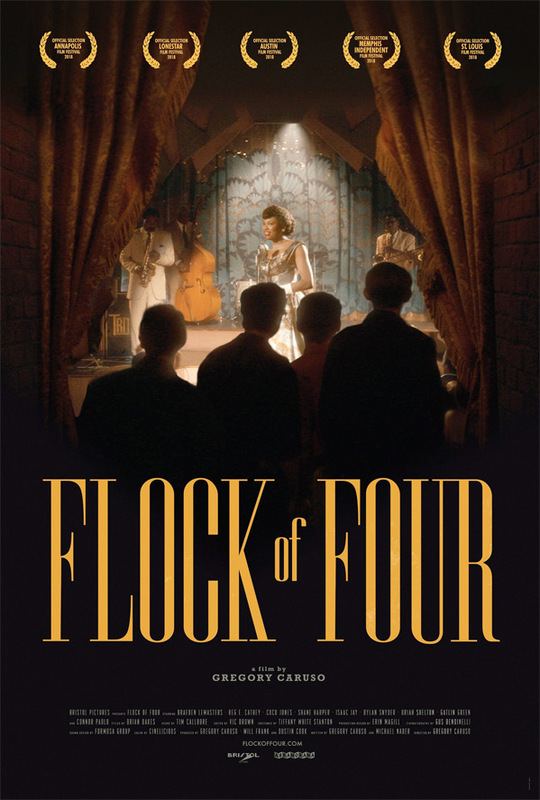 Flock of Four is directed by American filmmaker Gregory Caruso, making his feature film debut after a few documentaries and short films previously. The screenplay is written by Gregory Caruso and Michael Nader. This first premiered at the Austin Film Festival last fall, and hasn't played at many other festivals. Abramorama will release Caruso's Flock of Four in select theaters starting April 13th later this month. What do you think?